So, not every day traveling is hammock lounging and afternoon cerveca… so we have discovered. And when one thing goes wrong… it all goes wrong. Atleast that´s how it was this day. We were scheduled to wake up at 8am as we were leaving for our rafting tour at 9am. 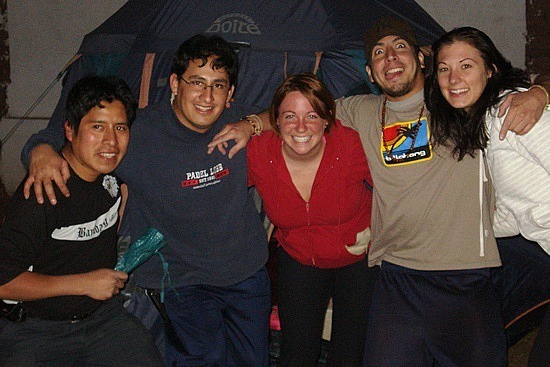 We had just gotten some new roomies as our friends from Aus had left for Machu Picchu the day before. At 645am… an alarm started going off. It got progressively louder and more annoying. I thought it was Savannah´s for us to get up, so I yelled across the top bunk for her to wake up. She yelled back that it wasn´t hers, it was the girl below me. We tried yelling at her, knocking on the bed, I even shook the bed (from the top bunk) as hard as I could. FINALLY, like 10min into this alarm, she shuts it off. UGH! At 9am, we showed up downstairs to meet our ride dressed in shorts and tshirts, with sandals and a towel… as we were told that is ALL WE SHOULD BRING. Our tour guide laughed and insisted that we go back up and get sweaters and pants as well. And thank god we did. After a day of rafting, up in the mountains, it´s cold!! We walked out to get in our bus, only to discover we had to walk to the bus… only 3 blocks he said. 10 blocks later… we found our bus. The bus ride was going well. All of a sudden, we came to a stop in the middle of the highway. We were all looking around to see what was going on. Out the front window, we could see the road was LITTERED with rocks and stones. There was a farmer´s strike! Our guides ran ahead of our bus to clean the rocks off the road and we swerved through them as best we could. Driving through one town, the roads were filled with protesters, so our bus turned down into the backroads to try to get by. All of a sudden, we come up to a corner and realize it is too tight for us to turn! The driver tries, nevertheless, smashing the bus up front and back into the walls of the homes and taking out pieces of a roof right next to us. 5 crashes in total! Crazy Peruvians!!! We ended up having to back out all the way back to the road… which required all the cars behind us do the same. This would mean we would be traveling down a different part of the river (we were on Rio Urabamba), rapids could be different than expected and there would be no sauna or hot shower at the end as promised. We did our safety talk and got into rafts and started down the river. We were in a raft with a couple from London, England (Louise and Chris) and a Scot (James). It was fun… lots of splashing and rowing, but there were only 5 actual rapids… the rest was a gentle coast…. What a waste!! The rapids we did go through were fun though. One time, we paddled back into the wave, so that the raft goes completely under the wave and back up. It was a little tough to breathe!!! Savannah was tucked up front for that part and ended up going into the river head first, haha! At the end of the 2.5 hour rafting tour… we changed out of our wetsuits (which was an event on its own for Savannah who solicited the help of a nice Argentian guy to help her remove it, as it was stuck to her body!). We met these Argentian guys… they were from Salta. So nice. We were freezing and they offered us beanies and socks to stay warm. We enjoyed a hot lunch of rice and chicken and tea and exchanged emails so that when we were in Salta, we could meet up with them and get a locals version of the city tour. We ended up getting a CD of all of our photos from the tour (we cant check them out here because no computers have CD drives…?) and then 30 soles back because of the stuff we missed out on. 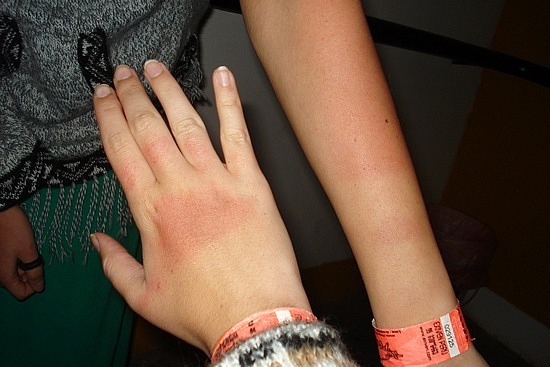 We showed up back at our hostel, EXHAUSTED, and a wild sunburn on my hands, feet and face was beginning to show through. (The day was cold and cloudy and we never thought for a moment about sunscreen, which I came to regret for the days to follow.) Entering our room, we find that all of our things had been moved off our beds and scattered all over the floor. We head down to the front to figure out what was going on. They inform us that they are full and our reservation was only for 2 nights (NEWS TO US?!?!?!). Nicest staff ever. They set up a tent in the yard for us with mattresses, pillows, bedding, the whole bit. We took quick showers and head to the bar for a much needed CERVESA!!! 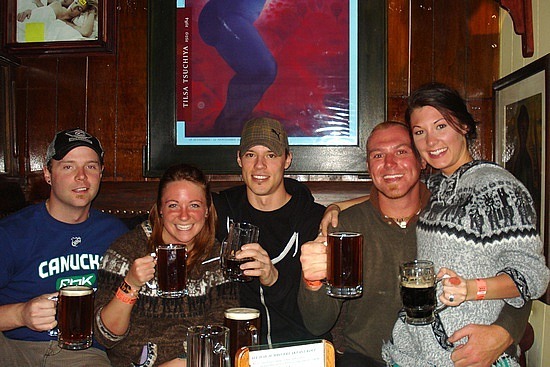 We soon realized that we were supposed to meet Alex, Dom and Sophie at the Pirwa hostel for their last night in Cusco!! I head back there arond 915, when they were due back and sat in the lobby, giving the staff evil eyes, waiting for them. At 10pm, I gave up and left a note, unsure that we would ever see them. We proceeded to meet some new friends at THE POINT over Brahma including Graham (London, England), Blain (Calgary/Kamloops) and Graeme (Victoria, BC). We all head out on the town to Mama Africa for some late night dancing!! (Alley, I said “So I figure we should head to the bar around 1230…” yes, me. The one who is in bed by 1230 usually! I thought you would be proud.) Best music ever! My Sharoda!!! We ran into the Argentian´s from Salta, some New Yorkers we met rafting… it felt like we knew everyone! We were all laying back, enjoying the night and filling up on water when all of a sudden, a figure came out of the shadows… haha… IT WAS DOM!!! We leaped up to greet our friends only to end up spending the next hour discovering their ride home from hell (because of the strike). At that point, they had been up for over 24 hours…. After a quick chat, we all hit the sack. It was FREEZING COLD in our tent… but when we woke up in our Alpaca sweaters, pants and leg warmers, we discovered how freakin hot it was!!!! WORST SLEEP EVER!! Only 4 hours long! But that was the end of the day from hell…. Jan 16 went much nicer. We lounged around in the morning (Savannah and Graham tanning outside, me in the tent nursing my sunburn). Savannah and Graham hit up the market and made a fresh breakfast of eggs, toast, fried cheese and avocado… with watermelon slices to follow. Mmmmmm….. I head to the market in the afternoon with Alex, Dom and Sophie to pick up their last minute gifts before heading out later that afternoon. 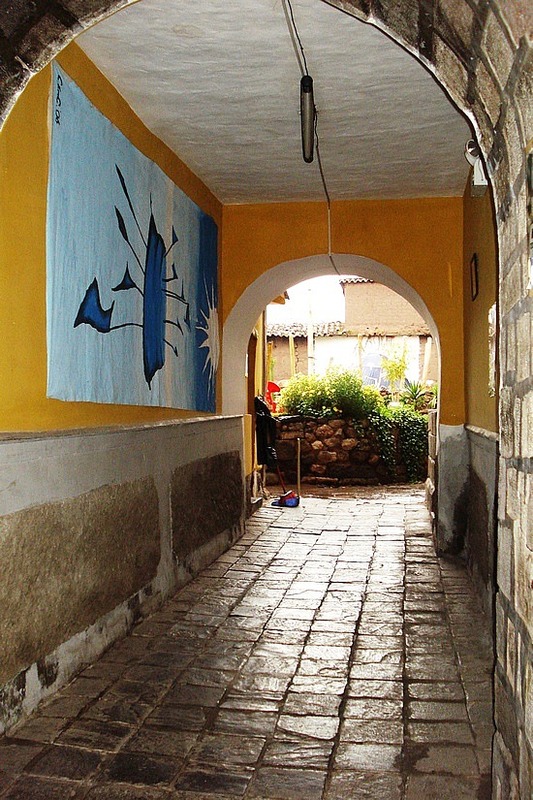 We got caught in the rain and made our way back to the hostel, said our goodbyes…. At that point, we met up with Graham, Blain and other Graeme and decided to head to Paddy´s (the highest Irish pub in the world in terms of altitude) for a late afternoon beer. 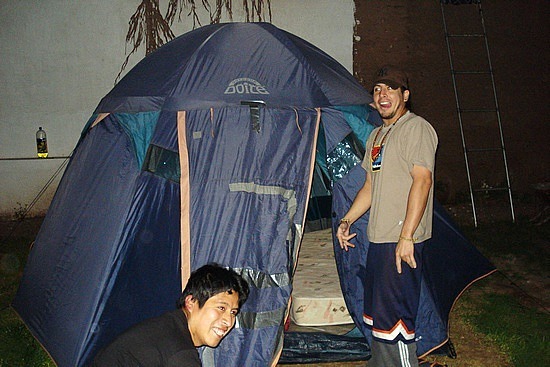 We had a few pints there, picked up the rest of our supplies for Machu Picchu the next day (after discovering that Blain and Graeme would be doing the same Machu Picchu trek and dates as us so we would go together), spent an hour or so playing cards in the courtyard of the hostel and hit the sack early. We had to wake up early the next day!